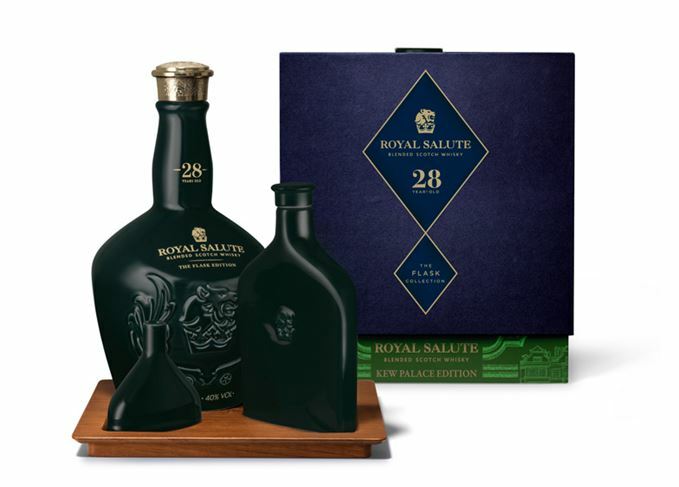 Luxury blended Scotch Royal Salute has launched the 28-year-old Kew Palace Edition, a limited edition entry in the whisky’s annual Flask Collection. The release is designed to honour London’s Kew Palace, paying homage to the palace’s kitchen gardens with notes of ‘scented flora like violet and aromatic leaves’ on the nose. Bottled at 40% abv, the blend is said to be ‘rich, round and silky’ and balances ‘Royal Salute’s signature style with super-rich fruits’ on the palate. The whisky is the result of a collaboration between Royal Salute’s director of blending, Sandy Hyslop, and perfumer Barnabé Fillion. The pair nosed ‘countless’ whiskies to capture their olfactory interpretation of the Kew Palace kitchen gardens. The ceramic flagon also depicts Kew Palace as drawn by illustrator Jason Brooks, while the whisky is packaged with a ceramic hip flask for drinkers to enjoy ‘on the move’. The bottling is part of Royal Salute’s ongoing support of the charity Historic Royal Palaces, which is charged with conserving Britain’s royal palaces for future generations. Royal Salute Kew Palace Edition will be available for a limited time at select luxury whisky retailers worldwide, priced at US$790. The release follows last year’s launch of Royal Salute’s 30-year-old Flask Edition, designed by London-based Afroditi Krassa.